With the PC release now upon us, everyone can finally dive deep into into Destiny 2. 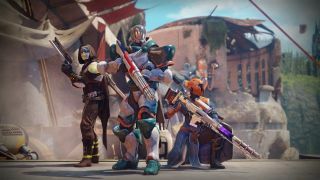 But whichever version of the game you're playing, you'll find that Destiny 2 has a whole lot to offer. Oh God, there's so much to learn and understand, especially if you're brand new to Destiny, or a lapsed player. While there's a lot of familiar stuff going on, there's are so many new ideas and little tweaks that can get lost in the chaos of running around punching space demons. To make your life easier, here's a handy collection of things that Team Radar (and other gamers) have found out over the game's first couple of months. Whether it's changes to the class system, or the new gun types, abilities that aren't obvious, or where the hell the Sparrow hover-bike has gone, it's all here. Want to know what to do with engrams, or how to activate class abilities? We've got you covered! This is a live list as well, so check back as we update it with new discoveries along the way. And if there's anything you think we should add, let us know in the comments and we'll drop it in. On your gear screen hold down L2 (or whatever key you're using on PC) to show all your stats so you can see everything without selecting them individually. Being able to see all the crucial numbers makes maximising your loadout so much quicker. Once you reach the EDZ in the campaign you'll find the Farm, Destiny 2's new social area. Obviously it's not the first game's Tower, and being a bit ramshackle, it can all look a little confusing at first. Just bring up your Ghost to tag all the vendors and points of interest to learn the layout. This won’t be an issue for lone wolf Guardians, but for those of us who’ve been dying to explore Destiny 2’s new campaign as a team of two or more, there are some limitations that are worth knowing about. Co-operative play won’t be unlocked in Destiny 2 until you’re a few hours into the experience, becoming available right after you’ve completed “Spark” - the third mission in the campaign. That means “Homecoming” and “Adieu” are only playable as solo experiences, no matter how much you want to witness the destruction of the tower with a friend (though some online strangers may pop up during one key scene). It’s not a massive setback, but it’s one to keep in mind if you’ve been expecting to jump into Destiny 2 as a fireteam from the get go. The Hunter's Arcstrider ability has combos! The Hunter's Arcstrider ability lets you carve up enemies with a big electric stick (technical term). While it's easy to just mash the buttons and laugh manically as everyone dissolves into sparks, there are combos and variations to the carnage. R1 (or whatever your melee input) - A basic slash. R2 (or whatever your grenade input) - A slash that also fires an arc beam. R1, R1, R1 - A basic single attack combo that ends with the stick hitting the ground for some area damage. R1, R1, R2 - This finishes the combo with a blast of energy. R1 then R2 - An upper cut attack useful against more powerful enemies. R2 while in the air - Lands a ground attack with a large area of effect. One big change to Destiny 2 are the new Kinetic, Energy, and Power weapon types. It gives you more freedom to use whatever gun you want in each slot but the key thing to remember is the Energy weapons. These will wear down enemy shields the fastest, and if you match the colour of your gun's damage type to the shield, it'll pop with area of effect damage that'll hurt surrounding enemies. Energy weapons will also do extra damage to opponents in a super state in Crucible PvP, so keep that in mind when the odds look stacked against you. Healing Rift - creates a circle of light that will heal anyone inside it. Empowering Rift - creates a circle of light that buffs everyone's damage. Marksman's Dodge - a directional dodge that will reload the gun you're using. Gambler's Dodge - a directional dodge that will refill melee energy. Towering Barricade - a large shield that can block off a large area. Rally Barricade - a smaller shield that can create a tactical barricade and reload your weapons when you crouch behind it. How do I get a Sparrow? You don’t have to be wearing your best armour or using your best guns to get incremental gear upgrades from Engrams in Destiny 2. In the first game, you needed to have your best stuff on show in order to get better loot when decrypting those shiny crystal treasure boxes. But no longer. As long as your best stuff is in your inventory, new drops will be pitched around the Power rating of your best gear, and may well exceed it. Where are my Engrams anyway? Engrams no longer occupy the same space as your weapons and gear. Instead they live in the 'Inventory' section to the right of your character screen, along with consumables and shaders. And what the hell's a Bright Engram? Previously Engrams came in colours to denote their rarity, from Uncommon all the way up to Exotic. Plus there were Sublime variations for a little extra surprise. Now there are Bright Engrams as well. These decode into a range of cosmetic items like weapon ornaments, shaders, ships, Ghost shells and so on. These can be acquired in-game every time you level up with XP, a continually ongoing process that occurs separately from your gear-based Power rating. You'll need to hit the soft cap of level 20 before this starts, but once you do, you'll get three as a welcome package. And don't forget, you'll level up faster for your first three levels every week, after the Tuesday reset, so use that time to farm quickly. I know the reaction to a lowly green gear item is usually that of disgust, but Destiny 2 starts you from the bottom, so don't knock 'em. Over the course of the campaign you'll have to return to various mission givers to turn in stuff or get new tasks. When you do, buy whatever they're selling. It's usually about 10 points higher than your current gear, and when you raise your stats, even higher level stuff will start to drop in turn. That, friends, is the circle of life (loot) in Destiny 2. Occasionally you'll see enemies with specific names and yellow life bars. It's always worth dropping what you're doing and taking them down as you'll get a nice little loot drop for your efforts. It might only be Tokens for your current area, but Tokens mean loot from the local vendors, and they stack up very quickly if you keep yourself busy. Destiny has always had exploding things to shoot, but they've always been really badly highlighted. Not this time. Nice big, impossible-to-miss red barrels. Take advantage of them as they can take out an entire group of enemies in one go. Seriously. These things are ridiculously OP, even compared to the usual FPS barrel. Use them. For some reason Destiny 2 doesn't make this very clear, but if you go to your vault and check out your 'Collections', there's a big pile of emotes you can use on your character. You can acquire and buy loads more later, but somehow a nice starter set seems to be the only thing that survived the destruction of the Tower. At a certain point in the campaign you'll find Strike missions activated. At this point you'll also get dynamic challenges on all maps, but ignore them at that point. They give you level-specific rewards so save them for when the story's finished. Once you've done the campaign and started chasing post-level-20 gear, you'll get bigger rewards from challenges. So remember to check them then, rather than wasting them now. If you get to a Public Event before it starts - easily done, given the timers on the map - then go to the post and activate the 'Rally to the Flag' prompt. It'll refill your super and all your abilities so you're ready for all the action ahead. Double check your gear for mods before scrapping anything! It's easy to get in the habit of scrapping unused guns and gear for Shards without a second thought, but take care. While the main number represents the base power, certain mods can add extra damage or protection that isn't shown. So, that chest armour up there has a 264 power rating but also has a mod that adds an extra 5 defence. Crucially, that extra power is taken into account when you infuse things. So while two pieces of gear might have the same basic number upfront, mods might make one more powerful. If you, or anyone in your fireteam is playing a Hunter, get them to equip the Keen Scout perk from the Nightstalker subclass. It'll provide the Enhanced Tracker ability which will highlight more on the map. More highlighting means more loot, and more loot is basically everything.